Executive recruitment China needs a keen sense of what kind of leader you need. Here I delineate several that companies overlook but are critical to the success of the hire. Companies have different points of emphasis. Many companies talk about putting the customer first. Some of the companies do it in one way or another. I never see companies advertising they serve the boss first, but I often see it in practice. Companies may say they put workers first ,but rarely do. Leaders who put workers first are often mistrusted by higher headquarters. Further, somehow HQ wants to be put first though the signs never say that. Do Your Subordinate Managers Motivate Their Team? Other bosses feel pretty proud about giving workers a job and feel gratitude should fill worker’s hearts. They did not understand that workers(subordinate managers) need more than a paycheck nor did they understand where customer service comes from. Many failed to see their own bosses well. If you own a 100 or 10,000 person company, you can put the customer first because you feel ownership because you are the owner. But your failure to put the Executives under you first would harm the ownership you want them to feel. So you are serving the customer while most of your workers are working to take home a pay check and not really working for the customer at all. This happens despite what the walls of your business say. Executive Recruitment China Candidates usually fit in one of the descriptions below, and you better know which one if you want a good Executive hire. I should also note that the descriptions tend to be all or nothing. In fact, some people get an A in Bosses, a B in Customers and a C in Workers. It is not usually as all or nothing as it may seem in this illustration. 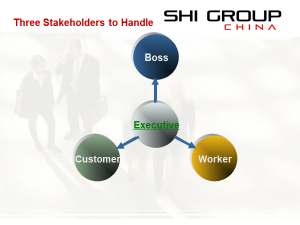 Executives need to face Customers, Workers (or any subordinate), and Bosses. Most executive hires cannot do well with all three of these important stakeholders. Lets look at some different kinds of leaders and their strengths and weaknesses. When I note a focus below, you can know that they are weak in the others not mentioned. Some leaders can handle the boss and worker, but have nothing left for the customer. They work hard to understand and get the boss what he or she needs. They take time and energy to notice and motivate workers. However, they see sales people as a different breed and do not support them or get behind them. They rarely visit customers and commit little energy to this piece. They usually blame the salesmen. These executives put tons of energy into customers and workers leading to great success, but they often expect the boss to treat then in the same way they treat their workers. Bosses on the other hand want the subordinate executives to treat them very well. This executive pays little attention to the boss and the boss dislikes them. They have nothing to give the boss and rather expect a lot of understanding from them. The Executives take care of customers and put a lot of emotional energy into bosses as well. They, however, either ignore the workers or treat them like dirt. They spend little time in the office or factory much less the factory floor. They see that as beneath them. They serve the boss and expect nothing from the boss and give nothing to the worker. Sometimes the boss makes the CFO the CEO or otherwise promotes. It is rather common. Why? Finance people usually are experts at serving the boss. Often the workers hate them and the customers want nothing to do with them. However, because they are experts at making the boss happy, they get the nod and the workers mourn. It is not just finance people who do this. Others can be guilty at various levels as you might imagine. These executives get get an A+ from workers Workers love working for them and will work for low wages to be under such a boss. They tend to have extreme expectations of their boss considering how well they treat their people. I see these executives put a lot of emotional energy into workers and rarely stand above them. They apologize in the rare cases where they need to let someone go. Seemingly everyone who leaves loves them. These people like the thrill of the sale. They are salesmen at heart and do not like to be bothered with operations. They are usually on the road and on the phone. They want to hand ops off to someone and forget about it. Needless to say the ops will usually get chaotic. The boss gets little attention and cannot bear to see the chaos grow, so despite the sales pipeline they cannot bear these guys as GM very long. Also, you can see by what candidates say they do. It gives you clues as to how they succeed with any of the three. Customers are a lot like Bosses in what they need and want. They also need convenience and attention. They want fabulous products or services that make them more successful. I might add they they also want to have vendors who they like working with. They like vendors who are fun and make them feel good. Amazingly enough, they want what bosses and customers want. I might note that we need to notice them. They want to know how to succeed and not live in darkness. They want the resources and path to grow in their ability. They want the freedom and encouragement to spread their wings. I think if I tell you that you need to meet with your direct reports at least monthly, you might roll your eyes. The managers you hired in China likely feel the same. We know it is important. But we do not often get it done. It does not have the jazz of the full blown fire fighting we often live by. Sometimes we have so much fire fighting that we cannot take time for these apparently non urgent matters. These simple meetings can be one of the most important activities you can take on each month. It can lower fire fighting until you have time to make your company great. did the people you hirte apply that? 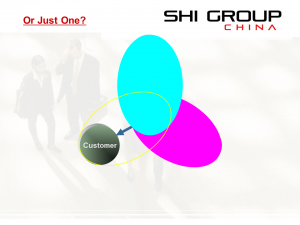 Further, if your executive recruitment China candidates put the workers first, then people under them will have the energy and the passion to put the customer first. Then you will have a whole business working for the customer. Finally, you will have a company that consistently puts the customer first. Of course, they need to have some ability in all 3 areas. So make time to start making once a month meetings with your direct reports and have new hires do it for their people to. Because when you care enough to hear from them, then they will care enough for your customers. Can You See How Much of This is Also True for Bosses and Customers? I think you can see now that this also goes for customers and bosses. They need the same thing though often in a different flavor as you have seen. They need you to sit down and focus on them as well. If you can see they meet with all stakeholders because they believe they are valuable and deserve to be heard and understood, then you may have a great hire. It is the first step to less fire fighting in your future. You might then have some time to think how to better serve other stakeholders if your executive stops hurting this one. Go ahead, take a step toward a better future. We all know there are yet other stakeholders and depending on the hire you may want to consider how they do with vendors and boards or government agencies. 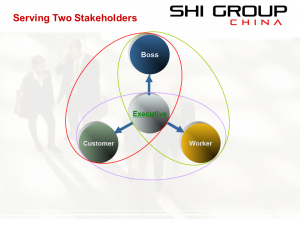 Generally if the hire sees these three main stakeholders well, he will cover the other quite well as well.